ASEAN Writes a Charter – Will It Cover Human Rights? The Working Group for an ASEAN Human Rights Mechanism (Working Group) held a strategy workshop in Manila from 21-22 March 2007. Sponsored by the Friedrich Naumann Foundation (FNF), it comes at a time of substantial progress. 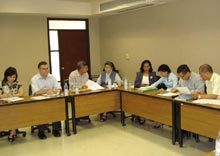 ASEAN ‘s Vientiane Action Programme incorporated human rights concerns in its agenda and produced a commitment to work on the rights of migrant workers and the rights of women and children. Next came the report of the Eminent Persons Group outlining an ASEAN charter that was endorsed in the 12th ASEAN summit in Cebu: it included the promotion of human rights in the list of objectives of ASEAN and suggested that the idea of having an ASEAN human rights mechanism should be further explored. Now the process is in the hands of the High Level Task Force (HLTF) of senior ASEAN officials who are actually drafting the charter. One of the arguments now is whether the charter should provide for an ASEAN Human Rights Commission. The Working Group sees this as a crucial opportunity and is arguing for a commission. It reasons that this can be done in such a way that only those countries that willingly agree will be covered by the remit of this commission, while others are allowed to opt in when they are ready. The HLTF is in the process of drafting the charter, but it is still open to recommendations and consultations with civil society. The Working Group’s strategy workshop discussed how best to use this opportunity to get its view across to the decision-makers. This stage is crucial. Once the charter is finalized and ratified, it will be very hard to bring in a new institution afterwards. Apart from this, the Working Group also discussed how to intensify their co-operation with the existing national human rights commissions that have been established in some ASEAN countries, and how to help countries that intend to establish one, such as Cambodia.